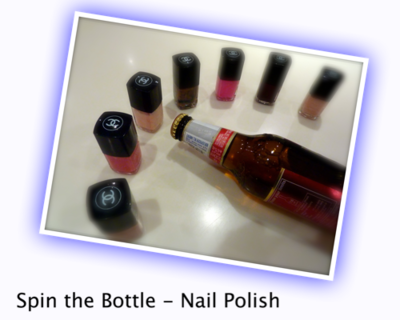 Play spin the bottle with nail polish. An epic game for sleepovers. Getting loads of interest. Get 10 or so bottles of nail polish and arrange them in a circle. You choose someone to go first and they spin. Whatever color the bottle lands on they have to paint a finger with it. Do this until everyone has painted all 10 fingers. Or you can do it with your toes. Great game idea I'll play it when my daughters friend comes round this weeked! my birthday is on Friday and im inviting a few of my friends! i have been wondering what i can do with my nail polish! after i have read this im so going to this! THIS Is A GREAT GAME ..AND RELLY F-U-N! We tried it and out nails really stood out. Good game. I'm having a sleepover on Sunday to Monday becuase it is winter break. I am going to try this! it was fab, every1 at my party <3ed it! great game played it before best sleepover game of all time!!!!! yah, what if you hate your nails after!!!!! OMG i would be soo sad, btw i am having a sleepover TONIGHT!!! still haven't found much. But it is a great website! this is so fun.my friend maddie and i just did it and it was really COOL. 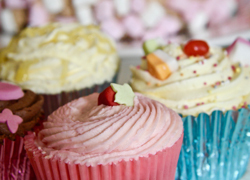 yayay i am SO gonna do this for my party!! Have a sleepover tomorrow night! Defo trying this, just gotta find/buy enough nail polish! It would be a awesome game to play!!!!!!!!! hey, im having a sleepover soon n im sooooo gonna do this. This is a really good game. take pics of everyones nails. sonds like a GOOD game!!!!! im gonna try it, and maby somebody should hav almost like the same game but with-a little twist to it!! and idk what all u h8rs r talkin about... this game is not only for little girls, it can b 4 older girls too!!! and it dont sound like a borin game, u guys is just h8-in cuz u either didnt come up with da idea or u just h8-in 2 b h8in!!! good game. my theme was pink so i bought ten different shades of pink it was really cool. It is really fun and keeps you ocupied for ages and you will have really colourfull nails at the end of the game! WHO would do that......not me!!! lol it was so much fun!!!!!!!!!!!! Cool! im gonna play this game for my upcoming party. I decided to do it for my pink ladies party and I thought it would be amazing. I'd got flourescent polish to make it more fun. Only half the people wanted to do it because everyone else had painted their toenails! Cool game. I tried it and i got an awesome rainbow of colors!!!! groovy twist on spin the bottle!! i played that game for my 9th birthday ;) its pretty fun thougggh , you just gotta be quiiick! this is quite cool but why don't you just liek have a makeover thing or like in never mind the buzzcocks the intros round lol. we had all of the girls bring a few bottles of thier polish to get enough colors and it was so much fun. we will be using this one again. Trying this this weekend. Sounds fun. i have played this, boy did my nails look weird afterwards! AMAZING game use it at every party you have if your a GIRL. I like the game it sounds fun and when school come we can still have the nail polish on and we can show off our finger nails. This sounds fun but some of my friends dont like to paint their nails. This game sounds awesome but some of my friends dont like to paint their nails. This game sounds great!!! I'm definately gonna play this at ma sleepover!!! It'll B hilarious!!! This seems cool. I think I'll play it at my sleepoove!! its good but what i did was get some nasty colurs and some nice and blind fold her so she didnt know what colurs she had. but i think maybe for younger kids to do that. not really adulty. I am having a sleepover tonight.We are deffintly playing that game.It sounds like an AWWESOME game. Its pretty cool. Maybe i'll do it for my 12th birthday!A bit girly though but who cares!!! Thanks for the idea! needs some boys, so if you have a brother get him to invite a friend and get them to play!!!!!!!!!!!! A new spin on the old classic, I LOVE it!!!!!!!!! girls who are having a sleepover should get on this. sounds like a cool game to play and a fun way of getting a rainbow of fab nails too! STUPIDEST THING ALIVE!!!!! NO JOKE!!! I love it gonna have so muchh fun with my 17 year old cuzin @ our sleepover! This game is so fun my b-day is comeiing so i am going to try it!!!!!!!!!!!!!!!! sounds like a real girly girl game i woudl only go there unles i had absolutely NOTHING to do!! me nd 2 ov mi m8s played it nd had fun...passes sum time nd u get lots ov diff coloured nails! Sounds like an awesome game, but how do u know who goes next?? u just choose someone?? wow what a gam my kids loved it! I haven't tryed but i will soon on my Birthday! WOW THAT GAME IS AWSAME KEEP SENDING IN THES GAMES I LOVE THIS WEBSITE ROCK ONNNNNNNNNNNNNNNNNNNNNNNNN!!!! oh yes! spin the bottle! i think it's a very good idea and i will ask my freind if we could play it at our sleepover!! what are ya talking about it chould be cool!Iam going to doit and i am 16! This Game Is Soo Cool!My sisters my sisters friend and I played this So Much Fun! I thought this game was awesome! I had everyone bring crazy colored nail polishes (people showed up with highlighter pink and glow in the dark) and we all had to wear it to school!! that is perfect for girls between 13 and 15!!! like me!!! totally gonna do it! thanks! well i aint tried it out!but it sounds good i guess? i'm having a sleep over at a hotel and there is small space its perfect!! that sounds like a really kool game. HAHaha get guys to play this game! ya i agree with everone else that its for younger ppl but it still is a lot of fun with the gurls being hiper and goofy! Great game! its better for people as young as me! OMG!We did this at my 13th sleepover!It was so fun it was a time to just talk and get selted down!And besides alot of my friend kept the nail polish for lyk a week! WAY WAY COOL SO TOTTALY FUN! It seems preety cool. But, mayb 4 like 10 and 11 yr olds. Still, it could b fun! I'll try it. its a brilliant game i am having a sleapover so we can try it!!! Sounds like a tonna fun! I think I will try it at my party this week! right cool! I love it! GREAT GAME!!! IT WILL BE FUNNY TO SEE THE GUYS DO THERE NAILS AT MY PARTY!! lol!!! it sound kinda cheesey but it mite b fun! sounds quite decent. Maybe for younger kids!